Filling Up and Pouring Out | An English/Journalism student working and writing her way through her first summer internship. "We are cups, constantly and quietly being filled. The trick is knowing how to tip ourselves over and let the beautiful stuff out." -Ray Bradbury. I’m not sure if this day warrants some kind of spiteful victory dance or a couple of nostalgic tears. Today, the challenge draws to a close. To put it simply (and perhaps lamely), the challenge was most certainly a challenge. Surprisingly, I did not mind having so many deadlines. 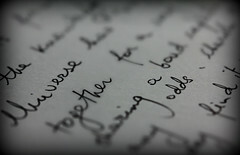 The difficult part did not lie in actually getting the writing done, but in coming up with things to write about. I never thought I’d say this, but I miss the days of having stories assigned to me. Those days of moaning about how I’d just like to write what I want are nothing but a memory these days. It must take a certain special talent to come up with so many ideas in such quick succession, and I’ve yet to develop or stumble upon it. But I think it’s projects like this one that help writers become more receptive to inspiration and more familiar with their creative processes. This project fulfilled its basic intention: to keep me fresh. In past summers, I’d take long breaks from writing and fall out of practice, making me write more slowly and clumsily the following fall when school would start. But this year I feel I’ve avoided that slump; I’m prepared to go into my internship (tomorrow! ), pen and brain ready. But that’s not all I’ve learned. Constantly looking for topics got me into the habit of looking at news stories critically. Over the course of the challenge I began checking npr.org and stltoday.com daily, learning how they cover different stories, attribute different sources and how their news bloggers blend their opinion with facts. And by hearing other bloggers’ voices, I’ve continued to hone my own. My older posts sound completely different than my newer ones. Because I’m not writing for a news service, I can ease off my structured news voice and editorialize. I can even make (or attempt to make) jokes! It’s been a refreshing change. 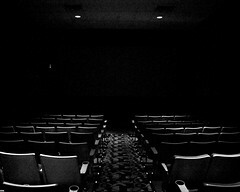 The blog’s viewing statistics will always vex me. It seems that the more random, personal posts like Awkwards and Awesomes and Seven Stereotypes I’m Guilty of get more views the day I publish them. But then the more news-related ones like St. Louisans and Their Loaded Question and You Are Who You Are on the Internet get more views over time. In short, readers, I don’t really understand you. I plan on keeping the blog going (knock on wood) for variety’s sake. While too much of both extremes tires out my brain, I suspect a little blogging amidst more structured assignments and projects will do it good. And as I continue to exercise my thoughts, I hope that at least some of you will continue reading. When I imposed the challenge upon myself I also imposed it upon you without asking. Thank you for sticking with me through it all. Here’s to the future of Filling Up and Pouring Out! 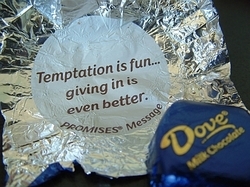 Dove chocolates are like the fortune cookies of the candy world. Unwrap one, and you’ll find a message on the inside of the wrapper. Those messages are called “Promises,” but they’re really rather vague. “Stretch your body. Stretch your mind.” “Believe in yourself.” “Shut out the world for just a moment.” What do those even mean? I’ve taken the liberty of providing alternatives to these messages which are more than inspirational. They’ll guilt trip chocolate lovers everywhere into being productive. You’re welcome. -Clean out that junk drawer. -Remember to renew your driver’s license this month. -When was the last time you cleaned out your closet? -Remember to smile at your coworkers today. -Wish the next person you see a good day. -This will be your last chocolate. Go eat an apple.